This unit is suitable for mixing syrups and liquids. The stirring shaft and the propeller are made out from S.S. 304/316quality. The stirrer shaft is directly fitted to the motor. The unit is supplied with an tubular adjustable M.S. stand. M.S.Channel stand with uppering and lowering arrangement is provided for more than 2 H.P. 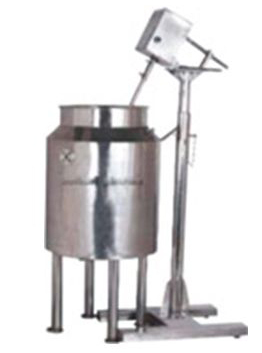 stirrers are tailor made as per customer's requirements. The motor used are standard 3 phase 1440 RPM.